(Trent Nelson | The Salt Lake Tribune) Brigham Young Cougars forward Yoeli Childs (23) shoots over Northwestern State Demons forward Malik Metoyer (10) as BYU hosts Northwestern State, NCAA basketball at the Marriott Center in Provo on Tuesday Nov. 13, 2018. Provo • Three games into the 2018-19 college basketball season, BYU is pretty much what everyone thought it would be, except for one fairly important detail. The Cougars can’t seem to shoot that straight, especially from 3-point range. 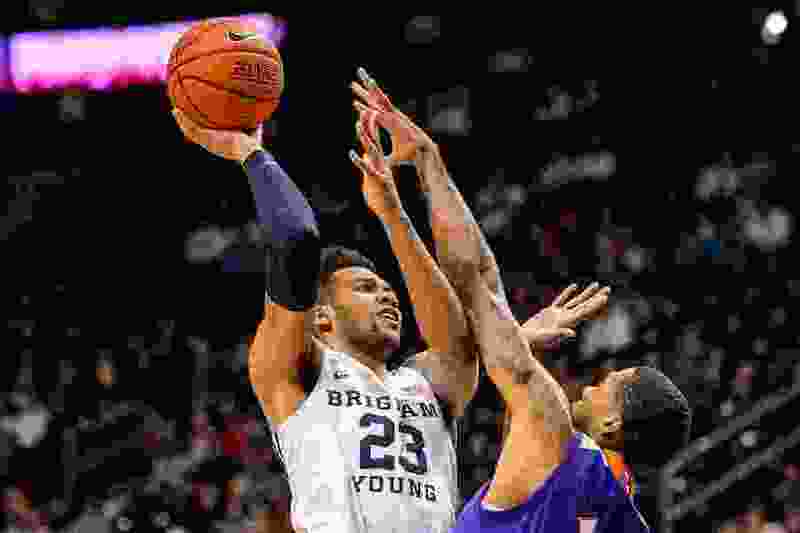 BYU made 7 of 15 3-pointers — after missing its first seven from deep — and eventually cruised past overmatched Northwestern State 82-57 Tuesday night in front of an announced crowd of 10,886 at the Marriott Center. Before a run of four straight treys after the 0-for-7 start, the Cougars had made only 12 of 60 3-point attempts in two and a half games, including the loss to Nevada and Friday’s win over Utah Valley. Those kind of numbers were too much for the undersized Demons of the Southland Conference, but probably won’t be enough against better competition later this month and next. Until then, the Cougars will rely on Yoeli Childs, who bedeviled the Demons with another double-double — 18 points and 15 rebounds — in 28 minutes. Freshman Connor Harding registered a career-high 11 points as BYU led for all but the first few minutes against a squad that lost by just 11 points at SMU last Thursday. “A lot of it has to do with our point guards sharing the ball and just making the right play, and us making the right cut,” Harding said. “That’s what happened tonight. The Cougars were sloppy on offense early, but Rose was happy with the shot selection when they weren’t turning the ball over 10 times in the first 20 minutes. TJ Haws, who finished with 12 points, six rebounds and four assists with just one turnover in 34 solid minutes, canned the first triple with 8 minutes, 40 seconds remaining in the first half and the Cougars were off and running. Zac Seljaas’ 3-pointer pushed BYU’s halftime lead to 42-25 as the Cougars closed the period on a 22-6 run. Childs came up a rebound short of a double-double in the first half, finishing the first 20 minutes with 12 points and nine boards. The Cougars opened the second half on an 8-0 run and looked poised to blow out the visitors from Natchitoches, La., but Ishmael Lane, Larry Owens and John Norvel, who combined for 43 points, finally got going. BYU was too much inside, however, outscoring the Demons 40-16 in the paint. The Cougars (2-1) return to the Marriott Center Thursday night to host Oral Roberts, a 70-69 loser to Cal Baptist Tuesday night in Tulsa, Okla.